I'm sitting in a groovy little cafe called Dak Daks. Car memorabilia adorns the place, while some '50s rockabilly tune plays in the background. I'm feeling a little queasy, so I forego the bargirl's suggestion of a bite to eat. Looking through the glass door of the drinks fridge, all the usual suspects are lined up in rows of coloured aluminium and glass. Nothing leaps out at me. Don't feel like Coke or Sprite, and a beer is definitely out of the question, with the way my gut's feeling. Not sure what may have caused this upset. Can't recall eating anything out of the ordinary. In the end, I order an iced coffee. Probably not the wisest move, but anyway. "Take a seat, mate, and somebody'll bring it over", she says. I park myself over at a little round red laminate-topped table that's bracketed by two black vinyl-padded chairs and take a look around the place. I'd been here before, but that was a few years ago. This bit of decor should give you a snap-shot of what the place is like. A framed Elvis picture/wall clock, right next to a revisionist artwork of '50s pin-up model Bettie Page. The walls were peppered with this and car-related signage, the kind of stuff that I used to see in antiques stores in the '80s, going for a song. These days, a tin sign advertising Shell Motor Oil or Peter's Drumsticks (an ice cream) tend to fetch a pretty penny when you see them in Antiques stores next to Chesterfield armchairs or numbered edition water-colours from the 1960s. This is the kind of place where the salt and pepper shakers are the actual shaker that you buy from the supermarket. Sugar sticks reside in coffee mugs that I saw in numerous houses of relatives and friends when I was a kid. Other tables have small screw-top jars filled with raw sugar, giving the place a pleasant, make-shift feel. I'm here because my son is (finally!) getting his hair cut next door at a barbershop called Kid Gamble. The establishment's logo shows a cartoon bulldog with boxing gloves on. The barber/owner is a young guy with a rocker hairstyle. He seemed like a nice guy when we walked in 15 minutes ago. "One of us needs a haircut", I said. Since I'm bald, it was easy to guess who was here for a trim. My son is on the verge of winning a Roger Voudouris look-alike competition. The iced coffee arrives while Buddy Holly sings about being happy to be livin' in the USA. Linda Ronstadt should sue. It's served in one of those standard '1950s diner' milkshake glasses. A scoop of vanilla floating on top, just a little smaller than the iceberg that sank the Titanic, with a light dusting of chocolate powder to cap it off. I take hold of the long-stemmed spoon sticking out of the glass and start stirring. Then I leave it alone for five minutes before mixing it again. The ice cream begins to melt sufficiently by then. I continue stirring it until it mixes with the milk completely, giving the drink a thick consistency. As I sit there, I write this post using a vintage Shaeffer fountain pen. The ink leaves a little too much feathering on the page for my linking, so I switch over to the spare pen that I brought along, a Jinhao 159 fountain pen that cost me a staggering one cent on eBay sometime last year. Plus three-fifty for postage, that is. This pen, although it's only got a steel nib on it, writes extremely well considering the price I paid for it. My son's appointment was over. He approached my table looking clean-cut and a little more mature. There was a neat side part on the left and not a hair out of place. "Very nice. Sharp. Now, can you keep it looking like that? ", I asked. "Do you want an iced coffee? Soft drink? Some lunch?" "Nah, I'll just have some water." He pours himself a glass and downs it in two gulps. We head over to the counter and I pay for my drink. I ask the gal behind the bar: "Is it okay if I take a couple of snaps?" "Yeah, go for it", she replies. All I have with me is my iPod Touch. It'll do. I've already taken the three shots above, but I just wanted to get a couple of the other wall near the bar. Cabinets filled with model cars, all manner of mid-Century furniture, mixed in with some pieces from the 1970s, Pop Culture references throughout, and some industrial fittings here and there. I do like the way it's all done. Although, if it were me, I'd tuck away the wiring a little more. Anyway, I didn't want to dilly-dally too much, since my stomach was still feeling weird. I just wanted to take some pictures. Primarily, I wanted a shot of the painting on the right, since my first glimpse of it when I walked into the place transported me back to circa 1978. I must've seen this kind of painting in quite a few homes that I visited when I was a kid. 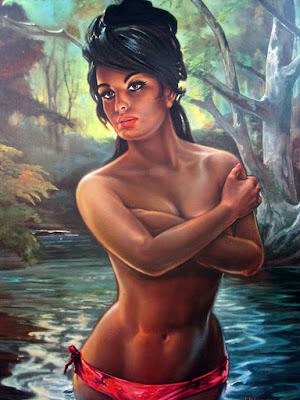 These evocative paintings of some Sophia Loren type, wearing not very much, and located in some dusk-lit exotic jungle. As a pre-teen (read pre-pubescent) in the mid-Seventies, the sexual/sensual nature of these paintings was lost on me. I just liked the idea that there was some well-scrubbed raven-haired beauty reclining on a tree trunk somewhere far, far away. Not exactly a native as seen in the pages of a National Geographic. I saw variations of these in the houses of various relatives. Uncle Vic had a one up in the lounge room of his Art Deco house in Brunswick. Not sure what his wife Auntie Maria thought of it, but she was strong-willed enough that it would have come down off the wall if she hated it. These paintings were done throughout the 1960s by a fellow named J H Lynch, a British artist. Reproductions were sold in the thousands, which would explain why I saw so many of them growing up. They would have been considered quite racy/sleazy/sensuous (pick one) back then. Nowadays, they have a kitschy value that makes them collectible. Luckily, reproductions can be found all over eBay. I should get one some day, if I ever put a bar in my house. Hefner the place up a little. I doubt my wife will mind. She got me a couple of framed Vargas reprints some years ago, but I never did get around to putting them up. Especially once the kids came along. Now, of course, the kids are teenagers. Something like this wouldn't even register on their radars. Hell, this lady's considered over-dressed when compared to what you'll see on somebody's Instagram page nowadays. When I Googled the term "1960s painting of lady in the jungle", I landed on this cool website. There's a house on a main highway on the way to work that sold last weekend. 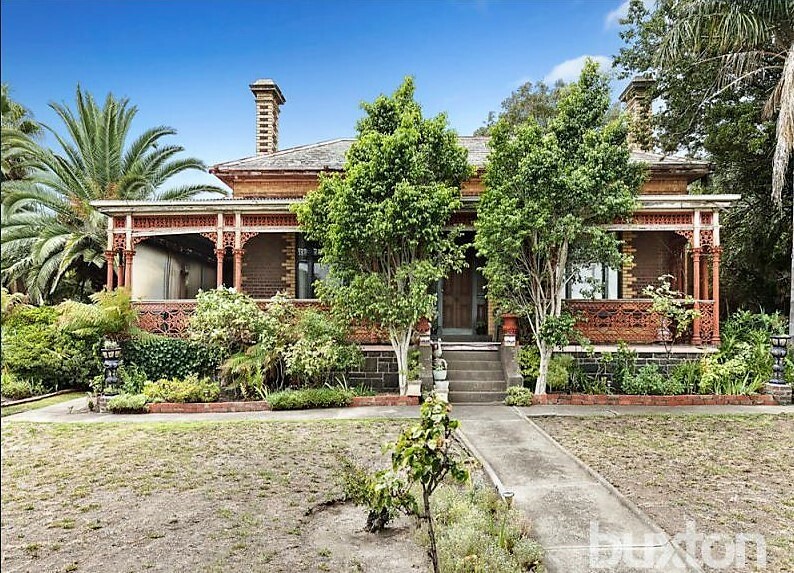 This house had been in the same family for six generations, according to the real estate agency blurb. I've been told that it may have been a speakeasy back in the 1930s. Not sure if this is true or not, but it makes for a nice story. I decided I'd go see if I could get a decent picture of the place from across the road. Nah, no luck. That fence was higher than it seems when you're driving past the place at eighty kilometres per hour. I can't tell you the number of times I've driven past this house on the way to and from work over the years. When I was told that it might have been a 'speak', I had visions of people approaching this front gate and having to give some kind of coded phrase or password to get in. Although, I'm not sure this fence would date back eighty years. The house sure does, though. 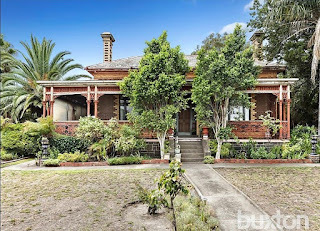 Built in 1874, Roseneath is described as 'an Italianate villa', featuring four bedrooms, two bathrooms, a pantry with cellar and a hothouse, among other things. I daresay the house looks like it has seen better days (just like Norma Desmond's place), but can you imagine how it would look if it were 'sensitively' restored, with a few modern conveniences thrown in? Scale back some of the overgrown greenery, restore the roof, a lick of paint, and it would look quite fetching. Can't imagine what it would have sold for. Some valuations have listed it at anywhere between 3.8 to 5 million dollars. Information on it's true value is scarce. Okay, these are the watches that I wore this week. I had the Submariner on on Friday night and half-way through Saturday. Spent too long setting up this shot. Chose the Key Line setting on the camera, to cartoonify it. The 'cigarette' in the ashtray is actually a rolled-up receipt from a 7/Eleven fuel purchase. I cut it down to the appropriate length of an unfiltered smoke and then glued it along one edge. I then crammed some scrunched-up paper into it and then began filling the end of it with tea leaves, packing them down every so often. This didn't seem to work very well, so I grabbed a stale cigarette from a pack that I used for photo ops and used the tobacco from it, thinking to myself; Man, you're goin' through a lot of hassle for a damn photograph. The real trick was the three gold bands on the end of the cigarette. 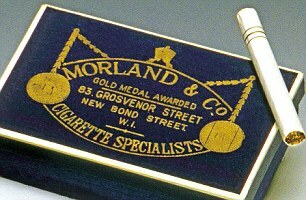 If you've read the Fleming novels, you may recall that Bond smoked a blend of Turkish and Balkan tobacco, specially made for him by Morland's Tobacconists of Grosvenor St. The three gold rings represent the three stripes of Bond's rank of Commander in the Royal Naval Reserve. I used to have a ballpoint pen which contained gold ink. That would have been swell. I ended up using a Lyra pencil with gold lead. I knew it would come in handy one day! Most of this week saw me wearing the Oris Movember Edition Diver SixtyFive. I switched out the leather strap for a black NATO. This morning's breakfast was a variation on a selection that Bond chooses in From Russia, With Love. ...So I won't go into too much detail. Basically, it was yoghurt with sunflower seeds and almonds, three black figs and some black coffee, in this case an espresso stretched out with boiling water. Okay, it's now almost 7:45pm Sunday night. We have a Labour Day public holiday here tomorrow! Right now, I'm gonna watch The Life Aquatic with Steve Zissou again. I only just watched it last weekend, but I feel like watching it again. Man's home is his castle, and all that. Thanks for reading, and have a great week, all! I’ve been eyeing those Jinhao pens. Maybe one of these days. I didn’t appreciate how far afield the kitsch of American culture has flung. Our biggest export! Nice update, have a great week. The breakfast Bond style looks delicious. What else does it have other than yogurt, sunflower seeds and almonds? Is that brown sugar?